What I would like to see is you attempting the same file at Opus with ~128 kbit/s. I'm curious at what bitrate your ABX results become more definitive. Yep, that's certainly more definitive, lol. I'm quite impressed, I don't think I can do that unless someone points out a certain thing that I have to listen for. There's even a slight indication that you can sometimes discern lossy from lossless at much higher bitrates. Not too shabby overall. Yeah, I simply got no words. So... what are the implications of this? Is Opus technically worse than AAC at higher bitrates? Is it just that he's gifted? Is it that AAC's artifacts are less difficult to detect? I guess we should stick with what works better for each of us, and for me Opus @ 96kbps is absolutely perfect, but this really has left me with many doubts. Yeah, that's why when I do an occasional ABX test I generally don't proceed to the next guess unless I am pretty confident I am hearing a difference as that helps get you in the ball park of when your straining and starting to guess vs know your hearing a difference etc. but after seeing your other post it seems you can do Opus @ 128kbps since you got everything correct with 16 tries to. but I am curious... can you do that (like ABX Opus @ 128kbps) on any random song, or just certain songs? ; but lets just say you can consistently ABX Opus @ 128kbps... I am wondering at which point you start to strain and are more or less guessing or semi-guessing? ; like say 160kbps or 192kbps? but one thing I noticed, at least for myself, is usually when your pushing the limits of your hearing or thereabouts, it almost seems like fatigue sets in when you start really focusing for any length of time and stuff you might have been able to detect initially, you start questioning whether your hearing a difference or not etc. p.s. for me, given my general testing here and there on my speakers/headphones (mainly my Klipsch Pro-Media speakers on the PC (which I would say are above average speakers for sure))... I would say once I hit 96kbps I doubt I can notice the difference (at least not reliably for sure) as I think I can hear a difference at 80kbps here and there but even here is not easy for me. hell, I still consider 64kbps pretty good overall as while it's worse than 96kbps, as 96kbps is safe for me, I would say 64kbps ain't that much worse and is 1/3rd less bit rate. like when just listening to a song straight up, the overall core sound is intact at 64kbps on my Klipsch Pro-Media speakers as I use 64kbps here and there but generally stick with 96kbps to be safe. NOTE: I know I should generally use headphones but I would guesstimate I won't be much either way given I would say my headphones (Sony MDR-NC7) are average-ish and I would not expect my preferred 96kbps Opus bit rate change much, if any, especially given the general Opus Wiki page says 'Very close to transparency' for 128kbps and I assume these kinds of claims are probably with people who are above average hearing (or no worse than the typical person) and the like which probably covers easily most people and I doubt my hearing is anything special. like decent(as I doubt my hearing is bad for my age bracket(I am 39 years old)), but nothing special. plus, I imagine some people who do testing for people to improve Opus etc probably have better than average headphones to. Yeah, please, try another song and let us know. <= 30s, per TOS#9, or do I have to remove the link? I have found another flac for the song. This time, there's no upsampling. I was afraid of that, files removed. can you do that (like ABX Opus @ 128kbps) on any random song, or just certain songs? ; but lets just say you can consistently ABX Opus @ 128kbps... I am wondering at which point you start to strain and are more or less guessing or semi-guessing? ; like say 160kbps or 192kbps? Yeah sometimes the instrument sound you're listening to remains in your head, I usually keep playing the song and focus on another instrument and section. Also sometimes, like yesterday I started listening artifact in all the songs, even in the flac, when that happens I cannot continue. Opus has never prioritized complete transparency at higher bitrates. We have AAC and MP3 that do a great job. Opus sounds very good as well. Like all codecs, I'm sure they will wring out as much performance as possible over time. But high bitrate is the land of diminishing returns and there is so much room for improvement/much to be gained at lower bitrates. Didn't know about that. Bear in mind Opus is extremely new when compared to AAC. Maybe they improve at higher bitrates. I don't know. It sounds transparent to me at 96kbps. "It’s true. I can explain in which exactly way the last two 96 kbps tests were pushing it. 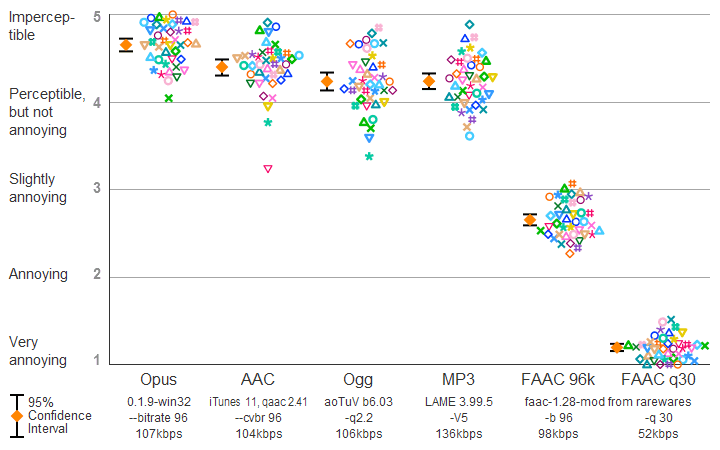 Most of average listeners hear artifacts at 48-64 kbps for HE-AAC and Opus encoders. The listeners who have participated in 64 kbps have commented that they couldn’t submit a high number of results if any for 96k tests (because they hardly could ABX it). During 96k tests a number of submitted results per each week drop to less than 50% than during 64 kbps test! 48-64 kbps tests- average listeners prevail. 128 kbps test - highly experienced and trained listeners mainly (hence not representative as a real-life scenario)"
I think that's pretty good info when it comes to the general public at large and pretty much sums me up to as 64kbps (based largely on my Klipsch Pro-Media speakers) is about the max I would probably do okay-ish at ABX tests. but once I hit 80kbps (assuming we stick to 16kbps each change of bit rate standard(i.e. 48kbps/64kbps/80kbps/96kbps etc)) it's really pushing it (I would expect to largely fail ABXing on random songs on my speakers at 80kbps, outside of certain parts in some songs etc) and 96kbps seems to be transparent for me, and given the above info in the quotes, it seems many people find it difficult to ABX at 96kbps and once a person hits 128kbps your already comfortably out of the range of most people (if not vast majority?). so that info is pretty much inline with my signature on Opus bit rates... 64kbps minimum, 96kbps (default), 128kbps maximum. I would say that's a pretty good default system for most people because your not going to far either way from that general center point (i.e. sweet spot) of 96kbps. so with those three choices your always having a decent balance of sound quality/storage space combo without things going too far either way. like with 64kbps your leaning towards storage space with sacrificing sound quality a little and 128kbps your sacrificing storage space a little for sound quality a bit but your not going too far either way of that general point (i.e. 96kbps) many (if not most? ; if not vast majority?) people start to really blur the line on detecting differences between Opus and lossless source on music. so in other words... most people should probably avoid bit rates lower than 64kbps or higher than 128kbps for music as a general guideline. p.s. but like I have said before... 64kbps is solid enough overall especially when you don't compare it to the lossless source in ABXing back and fourth between samples (like when you click A and B) and just sit back and enjoy. like 64kbps is noticeably safer on sound quality than 48kbps for a minimum increase to file size. I know one could say there is a 25% storage space savings between 48kbps vs 64kbps, which sounds like a quite a bit of storage space savings, but when your already at pretty low bit rates like that, it's not that much storage space savings in the real world (although going from 48kbps to 64kbps does give you a decent bump in sound quality over a wider range of music) unless you got a boatload of music as I would say choosing something like 64kbps over 96kbps might be worth considering though if your tight on space or don't mind sacrificing sound quality a little bit for the extra storage space savings. but going from 64kbps to 32kbps is not worth it as while it halves the storage space needed, the sound quality hit is a bit too much to where unless one is heavily favoring storage space over sound quality they would not choose 32kbps over 64kbps for music in general unless they had to if they wanted to get plenty of music onto a really limited amount of storage space etc. 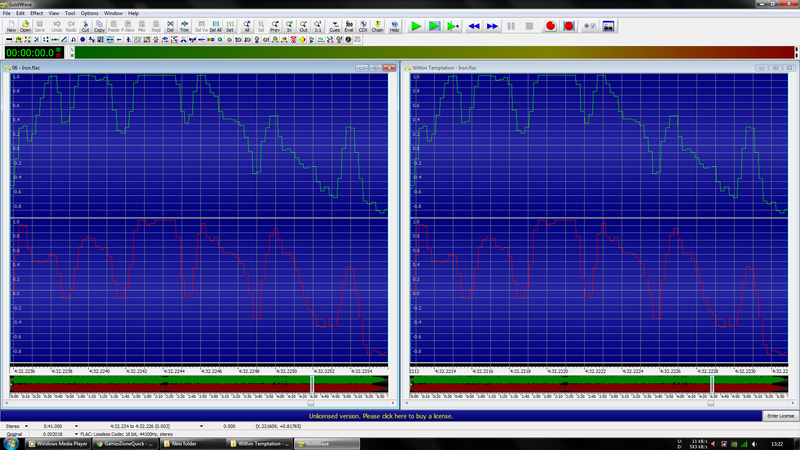 Even with very neutral, accurate gear and an experienced ear, would one be able to consistently discern at 160-192? And at VBR wouldn't 192 have the potential to reach 224? VBR, if done 100% properly, doesn't relate to any particular bitrate and instead uses whatever amount of bits to reach some specific quality level. Opus authors chose to rank quality in "average bitrate if used on some collection of average music", but that doesn't change the general idea of VBR.